Botanical source: Gamellia sinensis O.Ktze. Other Name: Green Tea P.E. Epigallocatechin gallate (EGCG), also known as epigallocatechin-3-gallate, is the ester of epigallocatechin andgallic acid, and is a type of catechin. 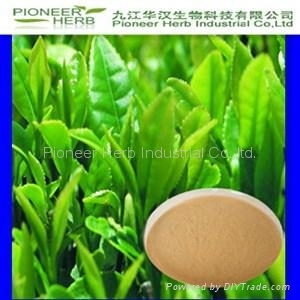 Green tea extracts are herbal derivatives from green tea leaves (Camellia sinensis). 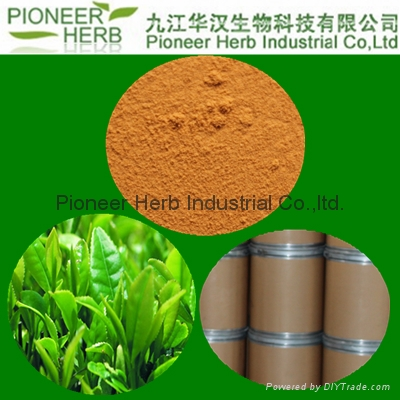 Containing antioxidant ingredients – mainly green tea catechins (GTC) . The biochemical properties of green tea extracts can be generally divided into four aspects – antioxidant, anticarcinogen, anti-inflammatory, and anti-radiation . Green tea extracts exhibit stronger antioxidant protection for human body than vitamin C and vitamin E.